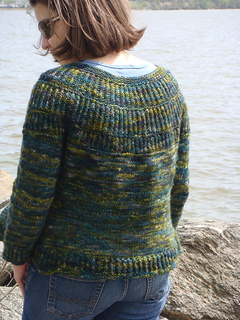 Love the colors of the yarn, hence the “seaweed” name. Had to figure out new gauge for this to fit the texture and yarn I wanted to use. I added sleeves, ala soulemama’s 2nd Shalom version (with twisted cable ribbing at sleeve cuff and bottom edge). 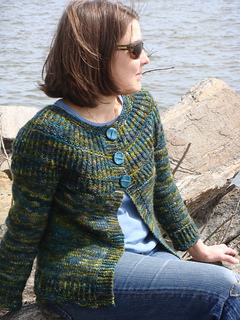 I made the sleeves following the Madeletosh Tealeaves cardigan proportions. I may yet add another inch of length to the body. The not-identical width of the ribbing on the yoke was an accident - had to accommodate for incorrect gauge understanding (and didn’t want to frog and start from scratch). My gauge was off for stitches, but not for rows! I’m not very happy with the flare at the bottom, but that may work itself out with another aggressive blocking.